Want to share your story and pictures on how you are connected to Saint Mary Church? You can pray, tell your story of how Saint Mary has touched your life – inspire others, volunteer, and share the resources God has given you. Write your story, share a photo or tell us your story through a video, to help Save Saint Mary Church by clicking the "SHARE YOUR STORY" button below. The Patrick J. Griffin Family of Lockbourne, OH became members of St. Mary in 1931. They attended Sunday Mass without fail, and seven of eight children attended St. Mary School, Elementary and High School. Msgr. Patrick Griffin, the oldest son, said his first mass there in 1945. Martin and Anne Louise were married there, as well. All of the children participated in school activities and the family took part in parish festivities through the years. The Griffins were greatly honored to receive The Family Life Award from the Columbus Diocese in 1952. Mary Ann and Agnes entered the Dominicans at St. Mary of the Spring, in Columbus. Margaret and Ellen became Franciscans in Rochester, MN. Daniel entered the Navy, married, and raised his family in New York. Martin lived in the Columbus area, where he raised his family. Ann Louise lived in various areas in Ohio with her family as well. The Griffins are no longer in Columbus, but their hearts are still at St. Mary. Daniel, Margaret, and Ellen are the only members of the family now living and they are looking forward to the completion of the restoration of St. Mary. The lightning strike in August 2016 was a “wake up call” that the Church itself needed major help, after 150 years of wear and tear. But it was also our personal call. We believe God led us back to Saint Mary parish “for such a time as this” – to get involved again in a big way, so future generations can also be blessed and be able to gather together, pray, and worship at the beautiful and historic SAINT MARY CHURCH. My connection with St. Mary’s is simply that my ancestors from both of my parents came from Germany and settled in now German Village. They all went to school there and to church there – in fact, some of my older siblings also went to school there. I always felt a connection to the parish just because of this. My parents also went to school there. The Veit family, the King family, and other ancestors/relatives with different last names also went there. St. Mary’s was often spoken of when I was growing up. I can’t imagine it not being there. The Heinmiller Family has a long history with Saint Mary Church that go all the way back to founding member and Building Committee chairman, Johann Ranft. Johann was a Bavarian bricklayer who helped with the construction of the church's four-course brick walls. John and Gertrude (nee Baumann) Heinmiller were married at Saint Mary Church by Father Specht in June 1906. 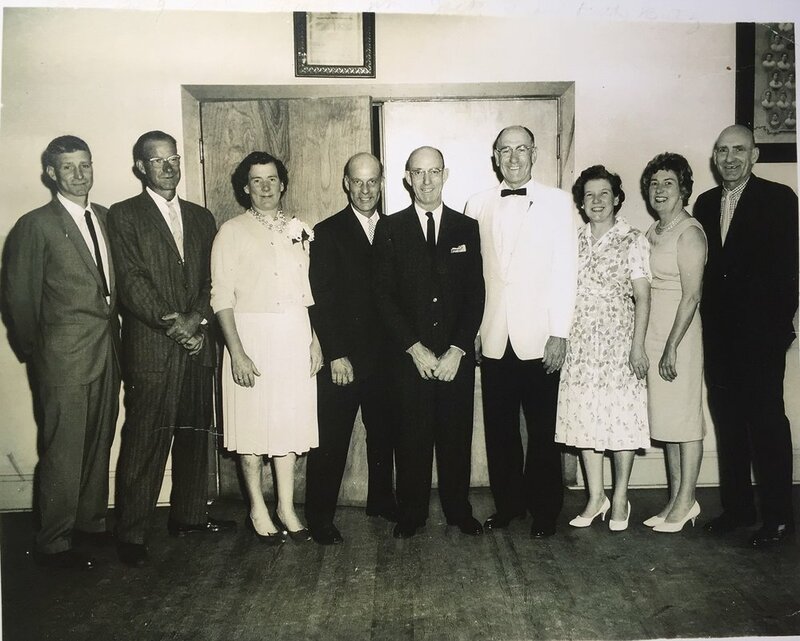 This photo of the 9 Heinmillers siblings was taken at the February 1960 wedding of Jeanette Heinmiller who is still a parishioner of Saint Mary’s. The family lived for several years at 514 South Third Street and later moved the family to a home on Rex Alley. Another Heinmiller parishioner was Henry Heinmiller, who was one of the city’s first fire chiefs. When Henry came back to Columbus from the Civil War he planted a persimmon tree (which he admired from his tour of duty down south) in his back yard of City Park and Mithoff. The tree that Uncle Henry planted is still there and to this day produces fruit! Fun fact: Ruth and Fran ended up marrying brothers (Ray and Paul Koebel) and their great-grandchildren are alumni (and soon to be alumni) of Saint Mary Grade School! Several grandchildren of John & Gertrude Heinmiller have returned to Saint Mary and are registered as parishioners.